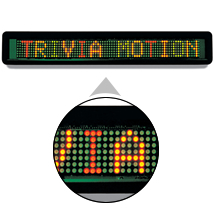 Multi-Color LED Message Display with wireless remote control. Create your own promotional message with bright LED in yellow/gold, red, green and multi-colored rainbow. Program the LED sign solid, multi, or mix color by letter, word or line. 25 display options. 8 fonts available. Multi-Motion speeds.